A lush 109-acre tapestry of dappled shade and vibrant splashes of color. The Fort Worth Botanic Garden, the oldest botanic garden in Texas, is a lush 109-acre tapestry of dappled shade and vibrant splashes of color. 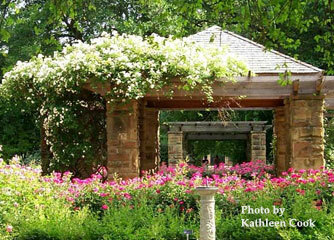 A peaceful haven nestled in the heart of Fort Worth's Cultural District, the Garden is home to over 2,500 species of native and exotic plants that flourish in its 21 specialty gardens. Enjoy the classic European design of the famous Rose Garden, where 2000 roses dance in celebration of the diversity and beauty of our national flower. Meander down the enticing paths, past intriguing sculpture and hidden pocket plantings to the heart of the garden. Sheltered benches invite you to sit, relax, breathe, and contemplate. Take time to stroll through the world-renowned Japanese Garden, with its koi-filled pools, dramatic waterfalls, sculpted hillsides, and meticulously crafted stonework. Discover the Japanese Garden Gift Shop for intriguing items to commemorate your visit. While you're here, consider the Gardens Restaurant for a delectable light lunch.